Kim Yung Soo, President, Kea So Joo, Inc. In May of 1994, Kim Yung Soo (a.k.a. Joey Skaggs), president of Kea So Joo, Inc., sent 1,500 letters to dog shelters around the U.S. soliciting their unwanted dogs for $.10 a pound. The outrage was instant. The Kea So Joo, Inc. telephone rang off the hook. The outgoing message on the company answering machine was in both Korean and English, and was punctuated by yapping dogs in the background. It couldn’t keep up with the incoming calls and faxes. The return address on the letter was a copy shop/box rental storefront on MacDougal Street in New York City. Although Skaggs had mailed letters only to animal shelters, the recipients, with righteous indignation, turned theirs over to their local media. The media, in turn, reacted as if they were an arm of law enforcement. Skaggs never answered a single call, fax or letter. Despite this, numerous television reporters stated they had spoken with representatives of the company. Others reported that large dogs were missing off the streets. Several stated that legal charges were being brought against the company. One reporter in Atlanta warned viewers not to send money to the organization. Another reporter stopped an Asian restaurateur on the street, showed him the letter, and with an accusatory tone asked him if he had ever seen the letter before. The man’s name and the name of his restaurant were displayed on the screen. The copy shop was first besieged by journalists, then by health inspectors, police, and private investigators. Shop owner Abe and his assistant Rahul were in on the hoax. It was a real challenge for them to deflect the onslaught of angry people looking for Kim Yung Soo. The response from the public was as biased as the media. There were numerous threats, legal and physical, against the proprietor Kim Yung Soo, as well as offers to sell dogs, which were blatant attempts to entrap him. 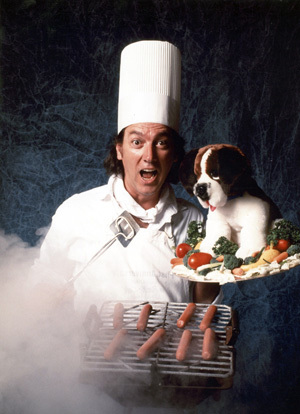 The general tenor was that of horror and outrage that Asians actually cook dogs for human consumption. All sorts of allegations were made about the immorality of buying and selling dogs for food. 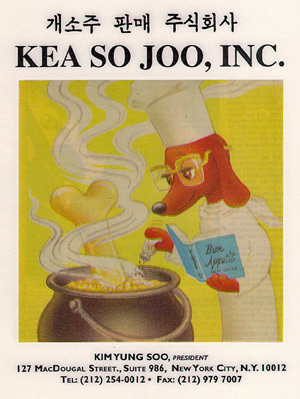 In fact, there was no Kea So Joo, Inc. (which in Korean means dog meat soup with alcohol). Nor were any laws broken. Skaggs orchestrated the hoax with help from several Korean friends plus his friends at the copy shop. His point was to illustrate the hypocrisy, intolerance and prejudice harbored by so-called animal rights humanitarians, as well as gullible media who freely express their racism and cultural biases. When police investigators finally connected Joey Skaggs to Kea So Joo, Inc., they assumed he was a broker for the Koreans. So the clamor moved from the copy shop to the outside of Skaggs’ apartment at 107 Waverly Place. Agents climbed up on the roof to see if they could spot dogs in pens in the back yard while haters milled around outside. For his own safety, and so he could record the flood of incoming phone messages, he stayed inside with the windows covered, leaving only to get something to eat by climbing over the fence from his backyard to his neighbor’s apartment and exiting from there to the street. On Sunday, July 17, 1994, an exposé written by journalist John Tierney, who had followed the Dog Meat Soup hoax behind the scenes from beginning to end, was published in The New York Times Magazine. Watch the Dog Meat Soup segment of an ABC TV 20/20 interview with Joey Skaggs. The full ABC TV 20/20 interview is in Videos, which can be accessed in the main menu.